Liftmaster Bin Dumper by Malavac, Inc. Welcome to Malavac! 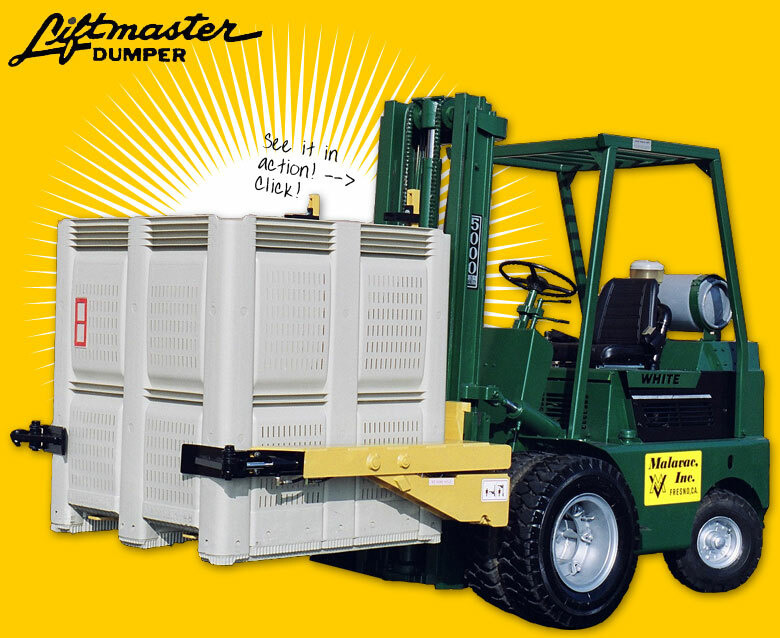 We are delighted to present to you our Liftmaster Bin Dumper. Our company has been around since 1970s and our goal since the very beginning was to provide superior products with great customer service. Please look around to see the different types of bin dumpers we have to offer. We would love to hear from you. A heavy duty main frame. A heavy duty bin holder frame. Two specially designed dump cylinders with sacoma packing. Two heavy duty bin holder cylinders. Fully protected cylinder & hose routing design. Complete set of high pressure hoses & fittings. We custom manufacture for different bin sizes. You will experience smooth and fast loading of seeds, fruits, vegetables, raisins, citrus, nuts, mushrooms, and numerous other applications. Liftmaster Bin Dumper can efficiently handle plastic, wood, metal, wire and cardboard bins. If you would like more information about the Liftmaster Bin Dumper, please contact us!